Bonn has always been the centre of revolution in the past. Contemporary revolutionists populate the ‘Che Guevara’ with political satires, humour and revolutionary comments. Owned by A. Funke, “Che” is a popular destination to catch an instant drink or a hearty snack. 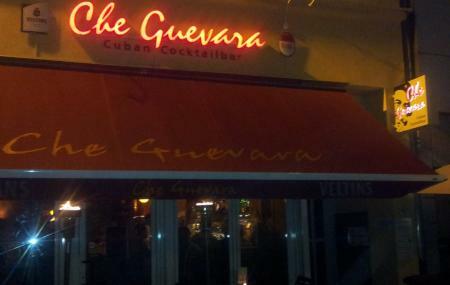 Che Guevara is a Food-and-Cocktail paradise offering personalized flavours and snack platters. The Cuban flair is evident in every recipe that sports of exotic cocktails, margaritas, cigar and cigarillos. The ambience is soft and hums with Latin beats. The star item offered by ‘Che’ bar is the Cuban cocktail named Bienvenido. You may also try the Papa Hemingway, straight from the Cuban town of Daiquiri. The place is popularly called ‘Che’. How popular is Che Guevara? People normally also visit Estatua De Beethoven while planning their trip to Che Guevara. Reliable cocktail bar. Good service. Outdoor seating. I little off the beaten track, but that's a good thing. Really nice cocktails and amazing shots!! !😊 Especially shot "muscle relaxer"! The mocktails here are very creative and the service is good. The ambiance is good for a chilled out time with friends. Very nice cosy place, good cocktails and friendly staff! !